fazeli, H., Soltani, M., davari, A. (2631). Effects of Pitching Motion on Shock Behavior in a Body-Wrap Around Fin Configuration. Journal of Aerospace Science and Technology, 7(1), 51-57.
hamid fazeli; M.R. Soltani; alireza davari. "Effects of Pitching Motion on Shock Behavior in a Body-Wrap Around Fin Configuration". 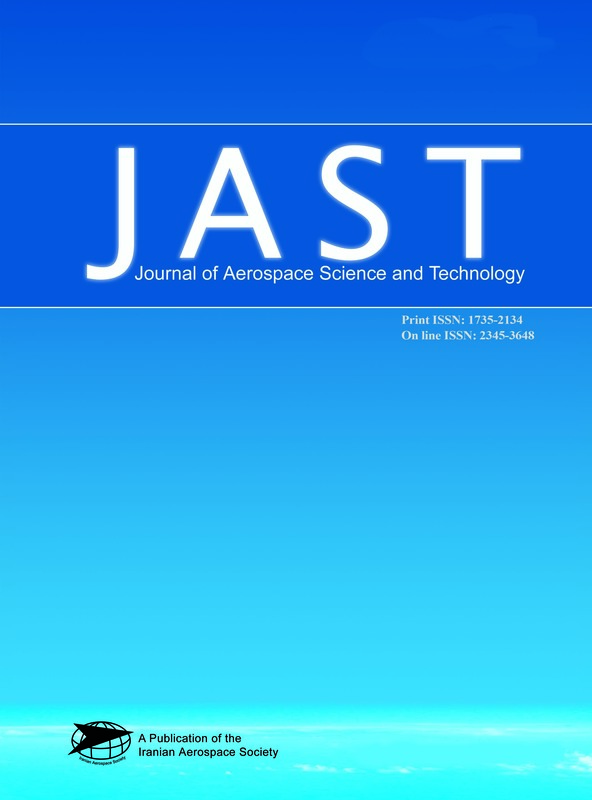 Journal of Aerospace Science and Technology, 7, 1, 2631, 51-57.
fazeli, H., Soltani, M., davari, A. (2631). 'Effects of Pitching Motion on Shock Behavior in a Body-Wrap Around Fin Configuration', Journal of Aerospace Science and Technology, 7(1), pp. 51-57.
fazeli, H., Soltani, M., davari, A. Effects of Pitching Motion on Shock Behavior in a Body-Wrap Around Fin Configuration. Journal of Aerospace Science and Technology, 2631; 7(1): 51-57. Unsteady dynamic behavior of TTCP model with different wrap around fin sets were investigated in a trisonic wind tunne. The aerodynamic coefficient force measurement in this wind tunnel shows good agreement in comparison with that of the NASA Langley Research Center in static case. The model was sinusoidally oscillated at three different frequencies of 1, 3 and 8 Hz at M=2.0 and the effects of these frequencies on the shock angle were investigated and compared with the corresponding static case. Experimental data indicates that the static shock angle does not fall between the upstroke and down stroke dynamic shock angle at different frequencies which is different from experimental findings for flat fin configurations. This unsteady behavior could be added to the other anomalies frequently seen in the aerodynamic characteristics of wrap around fin configurations. Also shock development mechanism over the nose and several fin sets was investigated and the shock-boundary layer interaction near the fin/body juncture which leads to shock likes ? was clearly observed in this investigation.